The rights to an article that I wrote for Knit Now magazine have recently reverted back, and I thought you'd all like to have a read, too. The article is longish, especially with the photos, so I've decided to spread it across two consecutive blog posts. Once time is on my side again, I'll put it all together into a PDF and add it to the Tutorials section. I'll confess, I'm not a lover of beanie Hats. The tend to sit there, squashing your hair, making you look like a bit of an egg head. And I'm a little confused too as to why they're the most commonly knitted Hat. Don't get me wrong, I'm not anti-beanie, and like any Hat they have their place. They suit our men folk well, and they do keep our ears toasty warm when they fit properly, yet when it comes to women, they are probably the least flattering style. Unless you have the right shape face for a close fitting Hat like a beanie, you'll want to consider one of the many other styles available. Roberta is one of the few lucky people who can wear beanie styles like Sumner with great effect – her long/oblong face and long hair are not out of proportion with this style. I travel to yarn shops with my Hat Clinic, armed with suitcases full of woolly Hats, and I'm often told by knitters that they're not a Hat person. That Hats just don't suit them. Invariably it'll be because they've not found the right style for them yet, or are unsure of how to wear a Hat, and have given up upon seeing the results without trying something different. The aim of my Hat clinic is to help knitters not only find the right Hat for them, but also to learn how to wear that Hat. And that's my aim here today. When it comes to wearing a knitted Hat, or any Hat for that matter, the one thing we need to consider is balance. For a Hat to look good, to suit us as and to keep us warm, it needs to balance with our features. And as wonderfully diverse as we all are, there aren't any hard and fast rules about how to achieve this. Knowing our face shape is a good place to start, as it will give us an idea of our strongest features, and most of us know our face shape already. Here, Charlie wears Annular, a slouchy beret that provides warmth as well as great style. For a Hat to stay put and do it's job, it needs to be smaller than the head. How many beginning Hat knitters have laboured over their handknits, only to find it won't stay on because it's the same size as the head? It always fills me with sadness when I hear such a tale, and so the subject of fit is an important one. Ease is the technical word that describes how much bigger or smaller a garment is in relation to the body. In a baggy jumper or loose fit cardigan, we want positive ease. When it comes to Hats, we're aiming for negative ease. But how much smaller do we really want the Hat to be? Ideally, you'd want to aim for somewhere between 2in/5cm and 4in/10cm of negative ease. How much exactly depends on a) the fabric or stitch pattern, b) the fibre content of the yarn and c) the look you're aiming for. Some stitch patterns, such as cables, really don't want to be stretched as much as others, such as ribbing. And some fibres, such as silk or alpaca, really don't have as much elastic memory as others, such as wool. As a general rule, if you're knitting a cabled Hat from an alpaca silk blend, you'll be wanting less negative ease. 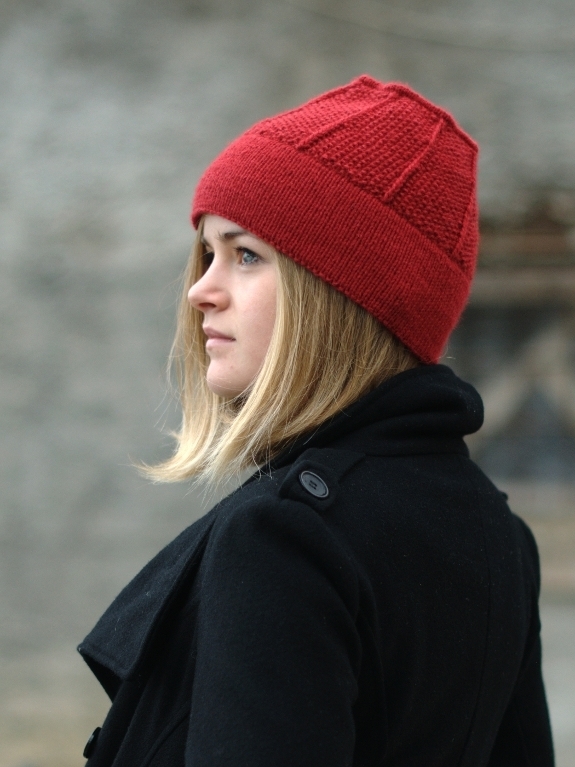 If you're knitting a ribbed Hat from pure wool, you'll likely be fine with more negative ease. Beyond the stitch pattern and yarn used, the other fact to consider is the fit or look. More negative ease creates a skinny or sporty look. Less negative ease creates a more comfortable, casual look. This is as much about personal choice as it is practicalities, and a good Hat knitting pattern will give you the finished size as well as the intended to fit size. Armed with this information you not only know the fit the designer intended for that Hat, but you're also be able to decide for yourself which size you'd like to knit. Once size doesn't fit all! I have another confession – the 'one size fits all ' tag that you see on Hats bothers me. A lot. Because it's just not true. Yes, knitted fabric stretches. And if you take an averaged size Hat then you'll likely get it to fit on much larger heads. But will it really look so lovely when it's stretched to capacity? In fact, will it even look like the same Hat? A beret can look more like a beanie on the wrong sized head. And how much will it loose in length? Here we have to remember that as we stretch a knitted fabric out widthways, it shortens in length, as the stitches compensate for the pull in the other direction. Once we've mastered Hat sizing, we can start to knit more intricate designs; Hats that require a more precise fit – those that use more detailed stitch patterns or are intended for a distinctive or unusual look. Taboosh is one Hat that benefits from correct sizing – it's structured shape would be lost if stretched too far. Pt.2 of the article will be posted tomorrow, where we get to the meat of the matter and talk about hair, face shapes & glasses, with loads of examples & photos. See you then!